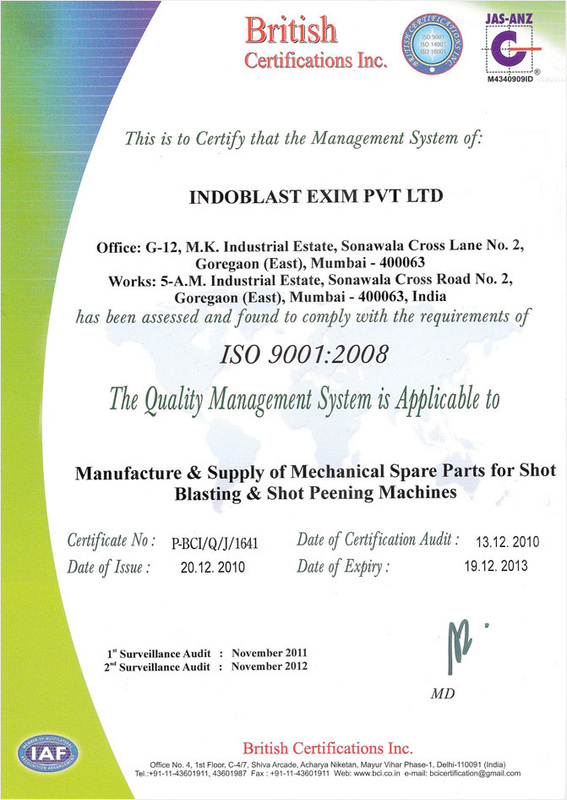 Indoblast Exim Pvt Ltd. has archived collectible status and immense admiration of customers since our inception in 1993 for providing top most quality Shot Blasting Machines & Spare Parts. Our products are carefully inspected so that you get only the unblemished products. These ascertain world class Shot Blasting Machines & Spare Parts marked by high durability & reliability factor. Our vast industrial experience & regular introduction of novel & improved machinery products for our worthy customers have enabled us to assert our hold in this competitive arena. The trustworthiness of our Shot Blasting Machines & Spares Parts is unrivalved. Besides, we firmly adhere to our commitment towards our customers, honest trade practices & staying at pace with the latest technological advancements. These enable us to cross every hurdle that comes our way and assert our individuality amongst others engaged in the same business. Our aim is to position ourselves at uppermost position by providing our customers superior quality products & after sales service & thereby winning their trust. Last but not the least, our never ending greed for optimal customer satisfaction, keeps us one ahead of our competitors.